Twice again as large as any other image in the photo essay, it appeared in the very middle of the page cutting across the fold. The caption directly beneath the image read, “A Fresh Start in New Orleans. 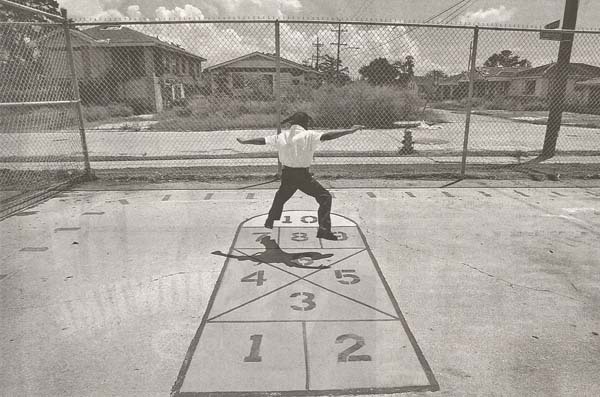 A kindergartner at his school in the Lower Ninth Ward which reopened last month after Hurricane Katrina flooded it in 2005.” The image has appeared elsewhere on the web, and in bright and vivid color, but here it is in black and white (as were the other images in the photo essay). Instead of a blue sky and billowing white clouds that encourage the sunny optimism of a new day, we get the muted tones of a grey scale that flatten the image and mitigate the difference between the “in here” of the schoolyard and the “out there” of the rest of the 9th Ward. And what we find “out there” is quite literally a ghost town, replete with boarded up houses and unkempt lawns and shrubbery growing out of control. Notice too, that there are no people outside of the chain link fence. It is a public space without a palpable public. Indeed, it bears a striking similarity in this regard to many images we have seen recently of the barren streets of Iraq. But there is more. For in every other picture in the photo essay the frame is filled with a distinct and manifest sociality: schoolmates are engaged with one another in groups and in pairs, while parents and teachers comfort and greet. And all are facing the camera, thus inviting some measure of communion with the viewer. The Bronx, Boise, San Antonio, it doesn’t matter, for these are common scenes from a national social imaginary that are acted out anew every fall in local communities throughout the land. But in the 9th Ward the conventions of sociality are either absent or subverted. The child is alone. Eerily so given that this is the first day of school. There are no reunions with friends or schoolmates, and parents and teachers are nowhere to be seen. 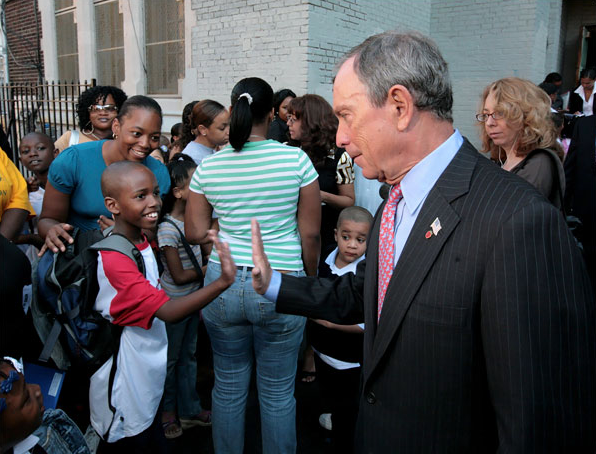 Moreover, the student’s back is towards the camera, and thus there is no opportunity for eye contact or interaction between the child and the viewer. His only companion is his shadow, the spectral illusion of otherness that moves only as he does, and thus accentuates his sheer social isolation. Most noticeably, there is no adult presence that says “we care” or “you are safe here.” One might easily imagine it as a recipe for a social pathology. And so the visual trope of the first day of school as a “fresh start” functions here ironically as an allegory for the fate of New Orleans. 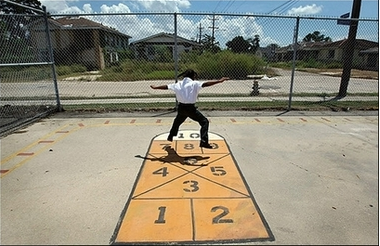 Just as the student, who should be with friends and teachers, is alone and isolated, so too is the 9th Ward in the larger scheme of things; and just as the student is left to his own designs to make his way without help or protection, so too, once again, is this New Orleans parish. “Sometimes,” a sidebar caption to the right of the photograph announces, the promise of a fresh start is “illusory.” And here we see the stark contrast between a national imaginary where fresh starts and renewal are taken for granted assumptions deeply rooted in the American dream, and a place where the pledge is a false promise … if not in fact a traumatic nightmare. ← Previous PostSight Gags: "September 12, 2001"